With my loved ones long away from me, I have missed the ability to use my iPhone's FaceTime over 3G a few times. Even if the quality would have been bad. Well, it seems that Apple is really getting ready for it, according to this screenshot that just appeared in iOS 5.1.1. 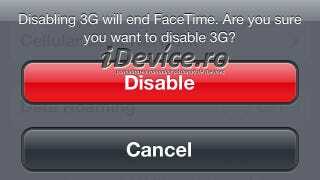 The error pops up when turning off 3G, according to Romanian Apple blog iDevice. We knew that Facetime works over 3G, but this new error in 5.1.1 is the only one that clearly makes a mention of 3G.